I have had the opportunity of spending a fair bit of time with this dog. 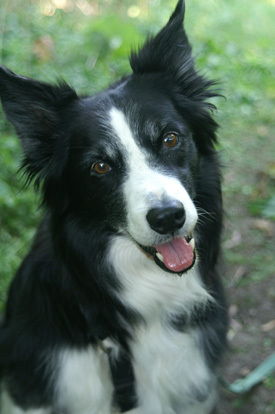 She is a classic border collie, nicely mellowed by the years. Tuned in and wonderfully responsive, she is exceptionally attentive to her human companion. On a walk, Taiga is always ready to receive a request and carry it out. Seeking eye contact as she trots along, she looks back over her shoulder; her eyes ask the question, “This way? Is this good? Right!” Her desire for interaction is quite intense; when you’re with her she’s so totally present and observant of every move you make. Deeply satisfying to be with, she is, literally and figuratively, an engaging dog.